Glutathione Peroxidase Assay Kit (Colorimetric) ab102530 can be used to quantitate the activity of all of the glutathione dependent peroxidases in plasma, erythrocyte lysates, tissue homogenates, and cell lysates. In the glutathione peroxidase assay protocol, glutathione peroxidase (GPx) oxidizes GSH to produce GSSG as part of the reaction in which it reduces cumene hydroperoxide. Glutathione reductase (GR) then reduces the GSSG to produce GSH, and in the same reaction consumes NADPH. 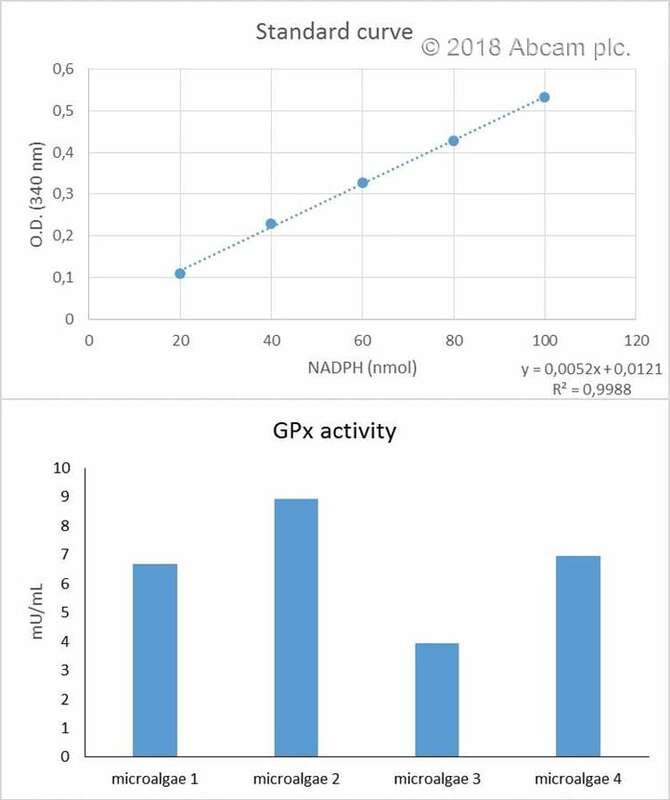 The decrease of NADPH (measured at OD=340 nm) is proportional to GPx activity. The assay has a detection sensitivity of ~ 0.5 mU/ml of GPx in samples. The Glutathione Peroxidase (GPx, EC 1.11.1.9) family of enzymes plays and important role in the protection of organisms from oxidative damage. GPx converts reduced glutathione (GSH) to oxidized glutathione (GSSG) while reducing lipid hydroperoxides to their corresponding alcohols or free hydrogen peroxide to water. Glutathione Peroxidase (GPx, EC 1.11.1.9) is an enzyme family with peroxidase activity, and plays important role in protecting of organisms from oxidative damage. It converts reduced glutathione (GSH) to oxidized glutathione (GSSG), to reduce lipid hydroperoxides to their corresponding alcohols, or reduce free hydrogen peroxide to water. Several isozymes have been found in different cellular locations and with different substrate specificity. Low levels of GPx have been correlated with free radical related disorders. Scatter dot plots representing the levels of glutathione peroxidase (GPx) in brain tissue in different mice groups. The effects of PCSE on the activity of GPX in a mouse UC model. Glutathione Peroxidase Activity measured in biological fluids showing quantity (nmol) per 1 mL after 10 min of incubation. Samples diluted 1-27 fold. Glutathione Peroxidase Activity measured in cell lysates showing quantity (nmol) per 1 mln cells after 10 min of incubation. Undiluted sample contained 2.5e6 cells per well. Samples were diluted 1-9 fold. Publishing research using ab102530? Please let us know so that we can cite the reference in this datasheet. Determination of GPx activity in microalgae samples. 1. Harvest the amount of microalgae necessary for each assay (initial recommendation = 15 mg). 2. Resuspend microalgae in 500 μL of cold Assay Buffer. 3. Sonicate the sample for 30 seconds on ice. Repeat three times. 4. Centrifuge 10 minutes at 4ºC at 10,000g using a cold microcentrifuge to remove any insoluble material. 5. Collect supernatant and transfer to a clean tube. -	It is recommended to perform several dilution of your sample to ensure the reading are within the standard value range. In this case the dilution factor was 1:50. Please let us know if the product ab102530-Glutathione Peroxidase can be run on RAT samples. I am happy to confirm that ab102530 (Glutathione Peroxidase Assay Kit) is suitable for all mammalian samples, including rat samples. Thank you for your response regarding my query. However, there is no point in issuing me a positive control as I have already done the experiment, using the other reagents in the kit. I do not have not enough lysate to repeat the assay. If I repeat the whole experiment, with the new positive control, I will effectively be wasting the rest of the kit, which as you will appreciate, is fairly expensive. If I could also be issued the reagents that accompany the positive control, this would be more appropriate. I am sorry this product did not perform as stated on the datasheet and for the inconvenience this has caused. As requested, I have issued a free of charge replacement of a new lot in addition to the positive control with the order number xxxxxxxxx. Inquiry: Hi, I recently tried your GPX assay and found that I got a response from my cells using a density of apprx 2.5 x 10e6. I haven't however got a response for the positive control, using 10ul. I have tried this twice. If you could tell me the concentration of the positive control I'd be grateful/why it is not working. Furthermore, using cells transfected with flag tagged GPX1 and empty vector (containing flag), I get a greater change in absorbance (normalised to protein concentration) with my empty vector than my GPX1 construct. Construct expression have been checked by western blot and the vectors are fully sequenced. Again this has happened twice. There is definitely no mix up in samples as the lysates are from 3 separate experiments. Why would I be getting a stronger reaction with the empty flag vector alone? I am sorry this product did not perform as stated on the datasheet and for the inconvenience that this has caused. As a compensation I am delighted to issue you with a free of charge replacement of the positive control from a different lot. The new order number is xxxxxxxx. I am currently in contact with the lab who are rechecking the positive control from this lot. In the meantime, they would like to know what difference you got in the absorbance from the vector alone and the GPx expressing vector? If there is an insignificant difference, it might just be experimental artifact and have nothing to do real values. I would like to ask you about possibility to obtain GPx Positive Control separately. My second question is, what is the catalytic concentration of this control material. Can I have an application sheet? I am sorry to confirm that we do not offer the positive control separately for purchase. I am sorry to not have a positive answer on this occasion and wish you a good weekend. My order# from Abcamencountered problems and is currently experiencing major delays with customs in my country. I want to inquire, will the products in this order still work if they were put for more than 4 days in room temperature? Abcam takes product quality seriously and we recently undertook an in-depth study examining storage conditions and antibody performance. After over 13,000 individual ELISA experiments, we have determined that storing our antibodies at various temperatures of up to 45°C for 1 week does not impact their activity. I would be happy to share a summary of our findings with you; please find the results attached. Thank you for your email and for the clarification. However, the fractionation kit ab65320 is for use in cells and not plasma, so would not be relevant for our plasma samples. So is this kit still able to measure both Cu/Zn and Mn SOD in our plasma samples? If so what is the protocol for this and would we need 2 ab65354 kits tio measure both SODs in plasma? I hope that is clear now, and looking forward to hearing from you. I am not in the office today, but in email contact. Please do not get confused with cytosol and mitochondrial SODs for plasma; the information I had provided was for general cells samples. I had missed the fact you are going to use plasma and plasma does not contain cells. You would not need ab65354.